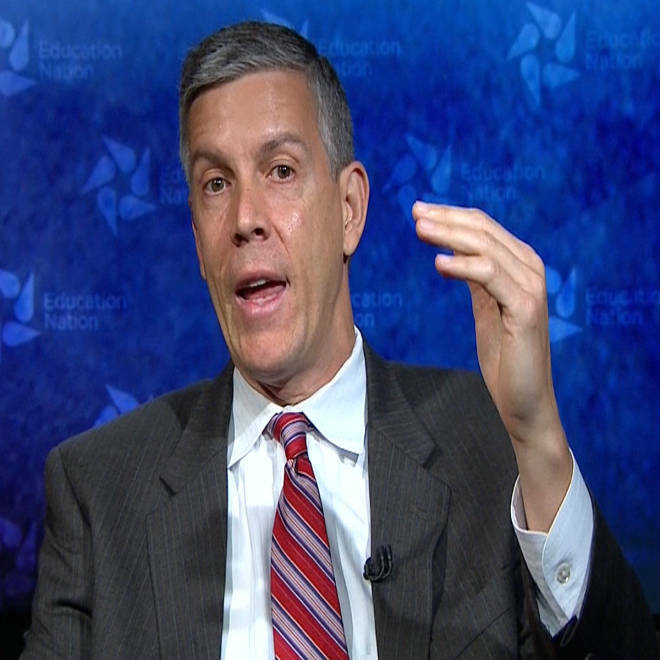 Arne Duncan speaks at Education Nation. The United States is in "a real state of crisis," Secretary of Education Arne Duncan said Tuesday, as findings of a study showed that American adults fare poorly in mathematical and technical skills needed for a modern workplace compared to their counterparts in most other developed nations. Duncan's comments were made during a panel during NBC's fourth-annual Education Nation Summit, a gathering on the state of education in America. "We have a real state of crisis. This is much bigger than education," he told NBC's Matt Lauer, adding that the economy was playing a part. "We have to close what I call the opportunity gap. The gap between the haves and the have-nots is far too wide." The study, based on tests developed by the Organization for Economic Cooperation and Development, a coalition of mostly industrialized countries, may be the most detailed look at education around the world yet. The exams were administered to 166,000 people, ages 16 through 65, in 23 countries in 2011 and 2012. Results show a startling pattern of the United States lagging behind several other countries, starting with test scores and young adults' graduation rates and later corresponding to a skills gap after graduation. Young adults in the U.S. also did poorly compared to their international equals not just in technology and math, but literacy, too. "We have to stop playing catch-up," Duncan said, who proposed that early intervention in the form of pre-school for every child in America is the educational solution for raising U.S. test scores. "Getting our babies off to a good start is often the best investment we can make. There's nothing political to this," he said. The study organizers assessed abilities in literacy and basic math in all 23 countries. In 19 of the countries, there was a third skill set assessed, called "problem-solving in technology-rich environments," which tested subjects' ability to use digital devices to find information, communicate, and perform common tasks. Japan ranked first and Finland ranked second in average scores in the three fields. Adults in Canada and Australia also excelled in all three fields. The U.S. was ranked near the middle in literacy and near the bottom in math and technology. Not only did Americans score poorly compared to other nations, the findings reinforced how hard it is to get ahead when one's parents aren't educated. In both reading and math, those with college-educated parents did better than those whose parents did not complete high school. "We have to make college more accessible and more affordable," Duncan said. But, he added, "Education is the best investment we can make. If you think education is expensive, try ignorance." France, Italy and Spain were close to the bottom in literacy and numeracy. They were not rated in the technology-rich environment assessment. Duncan touted technology as a "game-changer," and said President Obama has made upgraded technology in schools a priority of his presidency. Besides reading and math, test takers were asked to perform activities such as sort email and compare food expiration dates on grocery store tags. The U.S. overall did better than its international counterparts, on average, among 55- to 65-year-olds. But American scores were average among 45- to 54-year-olds, and among younger people, they were behind. "We can't just invest in the status quo," Duncan said. "We have to invest in a vision of reform."